In the News (riafan.ru): “The Ombudsman for Human Rights in the Russian Foreign Ministry said that the tolerance shown by the West regarding the appearance of anti-Semitism, Nazism and xenophobia has become the reason for the renewed departure of the Jews from the European nations today. “The situation is developing on a large scale and is already close to a critical situation. Human rights activists warn specifically that anti-Semitism has become the reason for the flight of the Jews from the nations of the European Union to Israel. The West, together with neo-Nazism, is reminiscent of the 1930s in Germany during the last century. My Comment: I think that everything is happening according to the plan of the general egoistic development of humanity, which must bring a wave of anti-Semitism and general mutual hatred. The people of Israel will be the focus of this universal hatred. This appearance of egoism as total evil is necessary for activating pressure on the Jews, forcing them to implement the method of uniting humanity and in this unity, the discovery of the Creator. Question: The modern Israeli society suffers from divisiveness. People feel that they are strangers to each other, really to the point of loathing and hatred. Sometimes, you simply want someone to disappear, board an airplane with your family and depart forever. Answer: This is what we felt at the time of the Egyptian exile. This is the slavery when the ego dominates us, “plays” with us more strictly, and creates relationships like these among us. As a result, we find ourselves in a position where we simply have no where to go. Today, some still think that they can flee somewhere to another country, but nothing will help. Question: So, Israel will become a boiling pressure cooker in which people are locked up, totally unable to tolerate each other? Answer: Right, that is how it was in the past and it is what will also happen in the future. There will be no other choice for us besides attaining unity. In addition, being unable to find the exit, we will agree that unity is possible only above the hatred. Question: The chasms that divide the people have taken shape and crystallized for years. Today the impression is that it is impossible to build bridges over them. Is it possible to forget all of the differences and insults? Is it possible to take control over the negative potential? Answer: It is possible. I don’t ask you who and what you are, to what community or party you belong. It’s nothing like that. I know only one thing: I am with you, we are with everyone, we need to be together, and this is what I am going on. Certainly, we are different, opposed. We even hate each other. All of this is completely unimportant. Rather, what is important is only one thing: We must begin to connect and unite between us. We demonstrate this connection and unity through workshops where we sit very different people, strangers, reflecting the entire social spectrum. Let’s take one representative from each party, sit them down together and arrange a workshop and you will see that even in such a mixed composition, they will suddenly discover ways of connecting. They would discover this on condition: that no one tramples on the others and foments his hatred in this ground. On the contrary, each is ready to unite and connect with the others above all the previous thoughts and desires. So, we actually realize this, and in the center of the circle some kind of new force is revealed, warmth, mutual understanding, an ability to support and maintain a mutual connection. This is the second fundamental force latent in nature itself, the power of love. It is not the love that breaks out between a man and woman, but the same force that penetrates through interpersonal relationships. Today, we are in the dimension of hatred and egoism. I do not tolerate others; I always search for superiority above them and want to see them below me, under my control. But, it is impossible to continue this way. We have reached a point in our development where egoism is devouring us from within. It won’t let us live as before, neither the people of Israel nor humanity as a whole. So, for the first time in history, the wisdom of Kabbalah has been revealed to the world. Its function is to teach us how, under new conditions and in spite of the opposition, we can hold and maintain a good, mutual connection. Baal HaSulam, “The Last Generation”: It is a fact that Israel are the most hated nation in the world, either because of their religion, because of their race or because of capitalism or communism, or cosmopolitan reasons, etc. Since the hate precedes all the reasons and each one deals with his hate according to his own psychology, there is no other way but to bring the international altruistic communism, the religion of bestowal to all the nations. It is Israel that has to accept the international altruistic communism first and be a symbol showing all the beauty and goodness in this regime. Israel should be the example for everyone, and thus we can prevent the spread of evil in the world. If we had tried to do so since the days of the first Aliyah (immigration) to the land of Israel onward, we would certainly be in a totally different state today and all of history would have also followed a totally different course all over the world. Rabash, “Letter 66”: And indeed we do say in the Passover Haggadah: “From the start our ancestors were idol worshippers and now we approach the Omnipresent to serve Him” and so forth. All of the Mitzvot are corrections of the desire to receive in small portions that can be implemented only after the person rises above the Machsom (barrier). After he passes through the Machsom, he begins to pass through the parts of the desire to receive above the Machsom. First of all, the person himself passes through the Machsom and transforms his desire to receive into “for the sake of bestowal,” and after that he turns downward and elevates desire after desire. All of this activity is called repentance, in other words, he returns the desire to receive to an intention of for the sake of bestowal. Every acton like this is called a Mitzvah and is done by the Torah, meaning by the Ohr Makif (Surrounding Light) that transforms the corrections into possibilities. The first action is called the Exodus from Egypt. When I am under the Machsom, I don’t have a connection with the Light. However, above the Machsom, I already have Light, the power of bestowal, and I can use it for advancement and correction. I have the consciousness, feeling, intelligence, and power as a capable, mature person. I transform myself into an expert on correction on condition that there is Light in me. Light is the power of bestowal that is acting in me, and with its help, I can connect more and more new desires, one after another, and correct them. I turn to a higher level and receive additional power from it for the lower part that I want to correct, correcting it and connecting it to me. In this process there are three partners: the Creator – the origin of the power, me – the one who wants to correct, and desire – the place that I want to correct. With the Light that is in me, thanks to my connection with the Creator, I see exactly what is ready for correction in me and ask for this power from Him. I work with Him as a partner, for I am no longer found under the Machsom. Rather, I am together with Him, feeling Him. Therefore, I begin to clarify how it is possible to work with the damaged desire, how it is possible to awaken and elevate it. This means that I want to transform it from for the sake of reception to for the sake of bestowal. So, I ask for that. I don’t get any pleasure from this activity myself while I feel it as my desire. For me, it becomes more precious than my desire—as it is written, “Make that His will should be your will” (Pirkei Avot 2:4)—like a mother does with her child. I wrap His desire within my desire and that is how I begin to elevate it, asking the Creator to correct it for me, as I would for my baby. Then, I get the required power, intelligence, and feeling. After all, I don’t know how to correct what is below for this is a completely separate system, the AHP that is built within me, the spiritual womb. This means that, first of all, I grew in order to correct it. I accept a new system and join what is below to me. So after the correction we are juxtaposed to each other. Thus, many Partzufim are clothed one on the other. Question: Is it important for people who are engaged with dissemination to have passed through the Machsom? Answer: It doesn’t seem to me that the person who has passed through the Machsom will succeed more in the external dissemination. I am not sure that Rabash would have been more successful in dissemination than the average person in our group. So, Baal HaSulam writes that it is even possible to pay professional people monetary compensation. After all, it’s necessary to get as close to the people as possible. Certainly, it is clear that they would need to know the direction, the purpose, a bit of the explanations, but not too deeply, only according to the level of the people to whom they turn. The “…seven years of great plenty…” (Genesis 41:29) are given to a person so that he can organize all the conditions of advancement for himself. I try to be in bestowal, in connection with the group. I carry out actions and maintain various conditions. In the meantime, my evil inclination is not revealed. It is revealed, but on a human level, not on a spiritual level. Only after I prepare myself well do the “…seven years of famine…” (Genesis 41:30) begin. They don’t come just like that by chance, but rather as a result of a person’s effort. A new king arises in Egypt. This means that I begin to identify that my desire, my nature, is evil. Until then, I didn’t think so. I didn’t understand that this was so. I heard that the ego is evil, and this is clear to everyone. However, I thought that I advanced, that I wanted to attain spirituality, and I didn’t understand that my nature is the evil inclination. I, myself, must determine, recognize, that my entire nature, everything that is in me, is evil. It makes no difference what characteristic I pick. But we are not talking about the desire itself, about the material, but about the intention. This means that I must understand and gradually reveal that the intention for every desire or all of my habits is the opposite of spirituality. Seven years of famine is a critical understanding of the seven years of plenty. Now, I can examine and see that in truth there is not even one single characteristic within me with whose help it is possible to advance. Everything is under the control of an intention for the sake of reception. This is the work during the period of the seven years of famine. However, I see this after I approach the Light, the Creator. I understand and feel what the spiritual world is more and more, meaning the intention for the sake of bestowal. 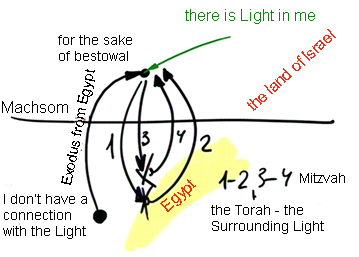 There is a point in me called Moses that is connected to the force of bestowal. Thanks to that, I know that a force like this exists in the world. Basically, I find it within me and not in other dimensions. This is my inner space, but, in the meantime, I don’t see it, I don’t identify it. If I want to build an intention for the sake of bestowal on my desires that are found under the control of the intention “for the sake of reception,” under the dominance of Pharaoh—in other words, to have the Creator rule over them—this is called moving from slavery in Egypt to becoming a servant of the Creator. I see how difficult this is and that it is even impossible because in every desire and thought in mind and heart I am totally an egoist. I didn’t think this before! Now, I constantly try to act for the sake of bestowal and see that everything goes out for the sake of reception. This is called the children of Israel passing through the 49 gates of Tuma’a (Impurity). This is revealed to a person slightly, gradually, so as not to give him despair and so he would surrender. It is up to him to continue to check again and again, until everything is clarified to the end, and he would see that there is nothing in him that belongs to the sacred. So, his prayer will be complete, and his scream will be a true scream. Only then will this be called MAN (prayer), and not before then, and help will come from above, which is called spiritual birth, the exodus from Egypt. Immediately, all at once, I will receive the ability to leave the dominance of the intention for the sake of reception that is called Pharaoh. I leave the control of Pharaoh and begin to acquire an intention for the sake of bestowal, and it is clear that this intention is clothed in the desires, in the characteristics, that were previously in me. In the beginning, I only was preparing and had to be in a state of the “children of Israel,” in the immature state, in the right line (Kav Yamin) and even the middle line (Kav Emtzai). It is up to me to conquer Egypt, and I begin to be connected to it, in the meantime without understanding that this is the Egyptian slavery, and after that, the true Egypt is revealed to me with the seven years of famine, and then I get the power to escape. It is because I invested all effort in the right line, as it is written, “He hath swallowed down riches, and he shall vomit them up again…” (Job 20:15). Question: We cannot take an example from the group because I don’t see anyone around me that deserves it. The only person I can take an example from is the teacher. Is it correct to do so or not? Answer: This is not correct. You need to make efforts to see the friends in a nice way, but you look at them in an incorrect form, according to your idea, they are stupid and lazy. You describe them in such a way, otherwise the ego and your pride will not let you live. You will be disappointed all the time because your friends are higher than you, and there are those that already have crossed the barrier (Machsom), and you haven’t achieved anything. If you would see the truth, you wouldn’t be able to stand it. Therefore, you are not shown it, and you can disrespect all the others. You have no possibility of seeing them in their real form and receiving aspiration. You cannot work toward the teacher as you work toward the friends. Your work toward the friend is to make him great in your eyes. Question: But you said that if the student does not adhere to his teacher, he will not learn anything. Answer: But what exactly does one need to learn? One learns from the teacher (Rav) how to adhere to the friends in order to reveal the Creator between them. The teacher is the guide that points to the direction to go. He does not call you to come to him; rather, he tells you to go in a certain direction! This is his role. In our days we have reached a new and special situation that does not have a holy leader as was customary with the nation through generations because today the entire nation must reveal the Creator. People need to be directed to the Creator and not worship their leader. This was once, but now completely different times have arrived. Before, there was no other way. The nation needed some leader that would take care of them so that a person would know that someone great prayed for him and would arrange his life. However, today times are completely different because now we all must recognize the truth at least a bit. Someone at the level of first grade and someone at the level of fourth grade and someone at the level of university and someone at the level of a professor—it doesn’t matter which level—each one needs to attain the truth somehow. One comes to adhere to the Rav by constant and internal devotion and not by ritualistic actions. There is no room for that in our times. Or, you perform virtues, use amulets, or you help people to understand what the work of God is for them. The world needs correction, and for that we all need to work according to the same system, one for all. The time of exterior effects is over because everything is concentrated internally. Of course for the simple person it is hard to stay on the road if he does not have the help of the influence of a “holy man,” including all his exterior signs. A person needs someone to take care of him like a big and important father, but this deflects him from his path. Therefore, there will be no more exterior effects because with them it is possible to attract those that are not capable of working on their correction.